The Young and the Restless spoilers tease that executive producer and head writer Mal Young will defer to one the fans outstanding storyline demands. Yes, the Christian (Jude and Ozzy McGuigen) reveal will finally take place. Y&R’s top backstage boss is continuing to consider Adam Newman’s (as most recently played by Justin Hartley) resurrection as well, as that is connected to the implied wrap-up to the paternity issue. Christian’s paternity secret had been shelved for months until Victor (Eric Braeden) basically blackmailed Chelsea (Melissa Claire Egan). The Moustache’s choice to force his daughter-in-law to attend the tree lighting ceremony at the Ranch seemed like a purposeful piece of plot meat that was thrown at the audience. Why would Victor play that card at this particular time? It didn’t involve his business interests and Chelsea hasn’t been purposely keeping Connor (Gunner and Ryder Gadbois) away from his grandfather. Pressuring Chelsea to persuade Nick to allow Christian must mean something is soon coming. Soap fans are smart, which means that they can often read between the lines. For example, they know that this author and these pieces that indirectly, or directly reference Adam represent hope, not reality. 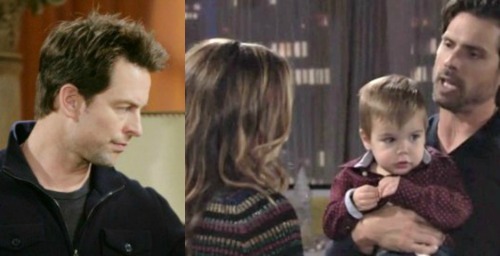 He’s not Mal Young’s nephew and isn’t somehow connected to Y&R’s writer’s room, or are both wild suggestions actually true? Zoom in for chin rub, pursed lips and narrowed eye lid shot. Speculation has long been part of the needed fuel that powers the soap opera engine. Such is the same case in this digital dimension as well. Addressing fictional matters is welcomed by light-hearted soap supporters. And now, after that commercial break, we return to the second half of our Genoa City-focused feature. So, Y&R intentionally addressed the fact that Victor is withholding Christian’s paternity from Nick (Joshua Morrow). He’s done so despite the bitter fight the Newman men are having. Why hasn’t Victor already hammered Nick with this devastating point? Though it seems like that’s what the Black Knight is building up to now. In threatening Chelsea, Victor was implying that he would destroy Chick by slashing Nick’s soul if she didn’t do as he said. That red flag was a signal to the fans; prepare yourselves for Nick to learn the supposed truth. All scientific tests conducted in this town are suspect. So whatever Chelsea and Victor think they know could be wrong. Then again, Adam may actually be Christian’s biological father. So Chelsea, or a mystery character, could have the paternity test adjusted when Nick demands it be conducted. Y&R could have a man order the test be altered. That unseen individual could be Adam who doesn’t return to town if this character isn’t being recast. In that instance, Adam would choose to remain dead in order to allow Chelsea to live her new life. That would indicate a conflicted Adam who feels his family is better off without him. If Adam is written back into the show, then he’ll return to claim his son. Both referenced options would surely need a lengthy lead-in. So, does any of this mean that Adam will be resurrected or that Michael Muhney will be rehired to play him? Well, it is truthful to say that Young can pursue these options if he so chooses. Seasoned soap fans have learned that anything is possible and must never be discounted.